They get us up. They get us down. And they look damn good doing it. For this week's Shooting Challenge, we celebrate the staircase. Take a photo of a staircase (preferably a really striking one!). There is no one set tutorial to photograph a staircase. But, having said that, the most popular aesthetic almost certainly the spiraling wormhole. And as luck would have it, these photographs are extremely easy to pull off, assuming you've found the perfect spiraling staircase. You simply aim your camera straight up or straight down, and the geometry of the space will do the rest. Just make sure to have your body and your camera well-secured if you're aiming downward. 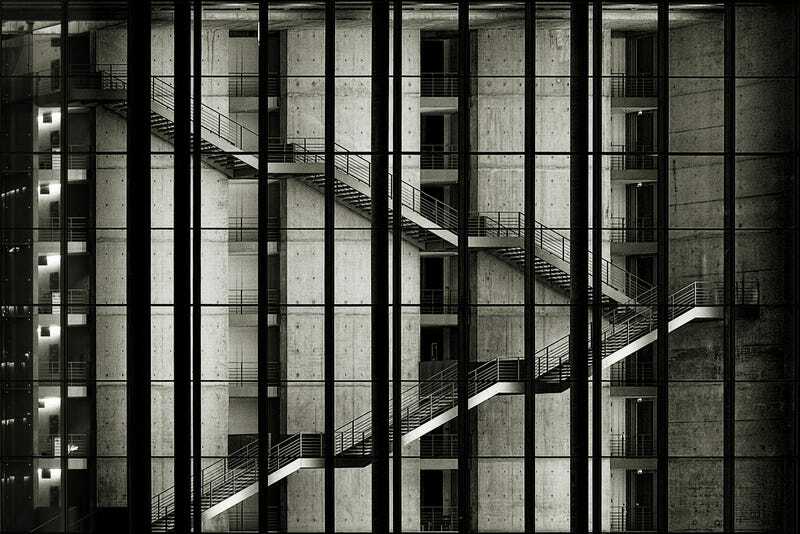 Our lead image is from Andreas Levers. It's of the Paul Löbe Haus in Berlin. And you can see just how he leveraged Photoshop to milk his source image for all it was worth here. Send your best photo by Monday, September 8th at 10AM Eastern to contests@gizmodo.com with "Stairs" in the subject line. Save your files as JPGs, and use a FirstnameLastnameStairs.jpg (970px wide) and FirstnameLastnameStairsWallpaper.jpg (2560px wide) naming conventions.